The New Jersey Devils defeated the Penguins 3-1 on a night when the Penguins could not catch a break from the goalposts, the schedule-maker, or especially the officials. The Pens accumulated 32 PIMs, had a penalty shot awarded against them, and Craig Adams was ejected from the game. This was on a play where he hit Martin Skoula after the whistle was blown for icing. Adams was whistled for a 5 minute major and was given a misconduct. Further review showed that the play was in fact not icing and the whistle should not have been blown, but it was too late to overturn the penalty, which the Pens did kill anyway. 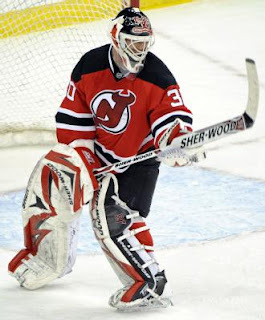 There was also much contraversy surrounding the Devils' 3rd goal in which Ilya Kovalchuk shot the puck on net and Marc-Andre Fleury's glove was interfered with while attempting to make the save. The play was deemed unreviewable, however, and the goal stood. The scoring of the game started out quickly with Patrick Elias scoring less than two minutes into the game, and Sidney Crosby answering 42 seconds later with a wrist shot past Brodeur. The second period was scoreless, with the highlight perhaps being Ilya Kovalchuk being stopped on a penalty shot by Marc-Andre Fleury after being tripped up by Kris Letang on a breakaway. The Devils opened the third quickly with an Andy Greene slapshot followed by Kovalchuk's highly contraversial goal. Matt Cooke also had a rough night, being the target of several questionable hits before finally dropping the gloves with Rob Niedermayer in the beginning of the third. Also, Tyler Kennedy has been healthy scratched for the past two games due to coaches decision. Kennedy brings a gritty physical presence as well as speed to the table, so this was an interesting decision by Bylsma. With or without Kennedy, the Penguins next play Sunday afternoon against the Tampa Bay Lightning in the third game of their five game road trip.